﻿ How does the human brain perceive the electromagnetic radiation as colours via photoreceptor cells? How does the human brain perceive the electromagnetic radiation as colours via photoreceptor cells? Colours are the definition of how objects reflect, absorb or transmit the electromagnetic radiation through their surfaces by changing the wavelength(or frequencies) of the light source pointed to them. Human brains have a complex mechanism to process the reflections of the electromagnetic radiation across an object by distinguishing among the wavelengths of the electromagnetic radiation in the range of 400–700 nanometers (also known as a frequency band of the electromagnetic spectrum called visible light). Electromagnetic radiation is composed of electromagnetic waves oscillating through space at light-speed within the vacuum. Photons(also called light quantum) are the smallest packets of the electromagnetic radiation and they are the force units of the electromagnetic force(which is a physical interaction occurring between electrically charged particles). Also, electromagnetic radiation affects the chemical reactions which occur between electrically charged particles, by transferring energy and changing energy levels between subatomic particles including electrons and protons. So that, photons may cause a chemical reaction altering the structure of the pointed target because of the passing energy from photons to the electrons or the protons of the pointed target. The frequency of a photon is closely related to the energy carried by itself so that every interaction between electrically charged particles which causes to change the energy of a photon increases or decreases the range of the frequency of the electromagnetic radiation. The electromagnetic spectrum is the range of all electromagnetic radiation from below one hertz to above 1025 hertz and consists of frequency bands such as Radio, Microwave, Infrared, Visible(widely called visible light), Ultraviolet, Gamma-ray. Visible light is the range of the electromagnetic radiation between 400 nanometers and 700 nanometers(nm) which human brains can sense without requiring any device such as night-vision goggles. In the retina of the human eye, light(or visual light) converted from the wavelength of the electromagnetic radiation to electrical signals via chemical reactions occurring among rod cells, cone cells and photosensitive ganglion cells, that is a biological conversion mechanism and known as visual phototransduction. Rod cells are rod-shaped photoreceptor cells and intensely concentrated at the outer edge of the retina. Rods are responsible for the scotopic vision(or the low-light vision) due to having the ability to detect wavelengths under 500 nanometers(low-light environment). Furthermore, rods are the reason of Purkinje shift, which is a change in peak sensitivity to light under changing illumination, from wavelengths close to 555 nanometers (green) in photopic (light-adapted) vision to 505 nanometers (blue-green) in scotopic(dark-adapted) vision(from A Dictionary of Psychology ). Cone cells are photoreceptor cells which function in the less intense light as opposed to rod cells so that cone cells are responsible for the photopic vision under well-lit conditions. The structure of cone cells and the structure of the rod cells are different in responding to the wavelength of the electromagnetic radiation. Rhodopsin is a biological pigment and light-sensitive protein, which is more sensitive to light than opsins. Opsins are a group of light-sensitive proteins involved in colour vision, circadian rhythm and pupillary reflex. Rod cells include rhodopsin and which is why rods are more sensitive to light. Cone cells include photopsins(cone opsins) which are the basis of the colour perception. There are normally three types of cone cells in the human retina, which individually include one type of photopsin depending on how cone cells respond to the wavelength of the electromagnetic radiation. S-cones(short cones) are most sensitive to the short-wavelength(blue). M-cones(medium cones) are most sensitive to the medium-wavelength(green). And, L-cones(long cones) are most sensitive to the long-wavelength(red). With these three types of cones, humans are able to perceive more than a million different shades of colour. Because of the number of the types of cone cells, humans have trichromatic vision. All types of colours are perceived as a combination of three types of cone cells in the human retina by the human brain, for instance, the sensation of white occurs when the electromagnetic radiation stimulates all types of cone cells on the human retina approximately equally. 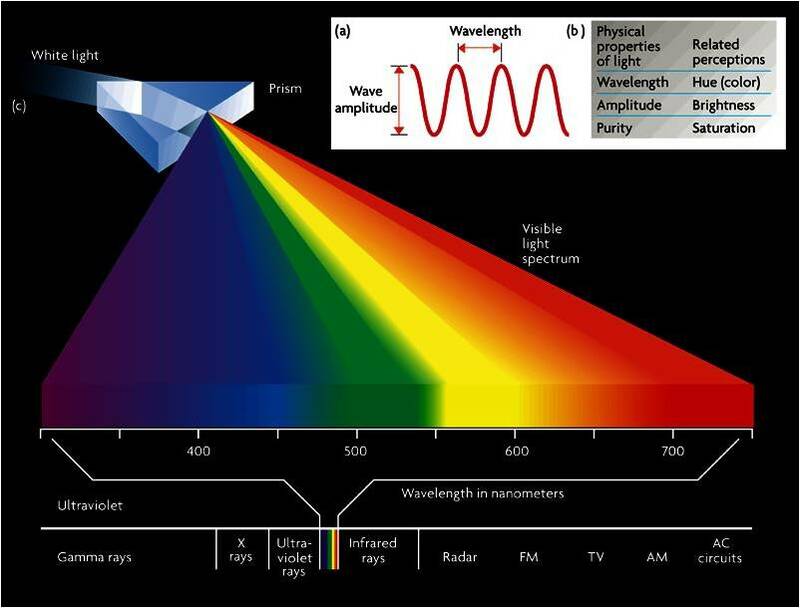 Human brains perceive the electromagnetic radiation as colours via photoreceptor cells(rods and cones) subjectively. The perception of colour depends on the amount of each type of cone cells and the wavelength of the electromagnetic radiation. Hence, the perception of colour is affected by the inherited genes, DNA structure and genetic mutations. For example, tetrachromats have an extra cone type as a result of a mutation that allows them to see up to 9.3 million more colours than everyone else, and colour vision deficiency(colour blindness) makes difficult to distinguish between the shades of red, yellow and green due to the inherited genes.